Located on the beautiful Miyajima island, Kurayado Iroha is a wonderful ryokan located right by the sea, midway between UNESCO Itsukushima Shrine and the Miyajima Ferry port. Indulge in delicious Kaiseki cuisine, take a dip in the rooftop bath, and enjoy an unforgettable, relaxing experience. Located on the serene island of Miyajima, Kurayado Iroha is a peaceful oasis for guests to relax in after a long day of sightseeing. This ryokan combines Japanese and Western styles very tastefully, with Western beds and traditional Japanese baths. 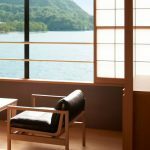 Guests will enjoy the coastal location with beautiful views over the Seto Inland Sea from both the rooms and the rooftop bath.